The Pitt men’s soccer team has been one of the school’s least competitive programs in recent years, but their fortunes could soon change as the group seems poised to move forward this fall. In its history, the squad — which started up in 1954 — has compiled a record of 398-449-100. It hasn’t had a winning season since 2000, when former head coach Joe Luxbacher led the team to a 13-5 year. Since then, it’s been a downhill slide for the program. From 2012-2015, the Panthers failed to win a conference game, and Luxbacher stepped down in November 2015. A month later, then Athletic Director Scott Barnes made the best hire of his 18-month tenure by bringing in former Wake Forest coach Jay Vidovich. Vidovich — a two-time NSCAA national coach of the year — is one of the most respected and well-known coaches in college soccer. He led the Demon Deacons for 21 years, winning a national championship in 2007. The success was sustained as well, with the Demon Deacons making the NCAA Tournament in 13 of Vidovich’s final 14 years at the school. From 2002-2014 the program sent 35 players to various professional leagues as the Demon Deacons became a soccer powerhouse. 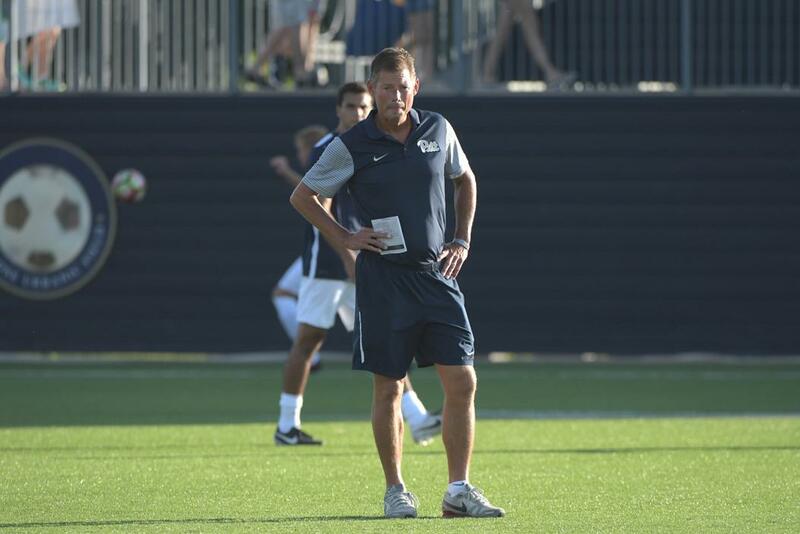 Following the 2014 season, Vidovich left the school to coach the Portland Timbers’ developmental team where he spent one year before coming to Pittsburgh. His first season with the Panthers didn’t see any improvement record-wise, as the team stumbled to a 2-13-3 record while going winless in conference for the fifth consecutive year. While the record itself doesn’t provide a bright picture, the team’s play was far improved. In the season before Vidovich’s arrival, the squad lost seven conference matchups by an average of 2.86 goals. One year later, the Panthers only improved their record by one, but the defeats were much closer — at an average of 1.66 goals. While the offense and the defense are both to blame, the group’s inability to score was their detriment. The Panthers finished last in the ACC in every offensive statistical category, including shots, goals and assists. It didn’t just plague the team this year and it’s been the main cause of the team’s conference draught. Since 2012, the team has scored only 14 goals in 40 conference games. That’s absolutely abysmal — and Vidovich knows it. In his 2017 recruiting class, the coach clearly made an effort to improve the offense. Each and every one of the team’s recruits is either a forward or midfielder, as Vidovich seems to be satisfied with his defense heading into next year. The prized player of the class is Kizza Edward, a forward out of the Soccer Institute of Montverde Academy in Florida. This past year, the Uganda native scored 25 goals while leading his team to a 20-0-1 record and a SIMA Winter FAB 50 National Title. His performance over the course of the year made him the No. 41 ranked recruit in the class of 2017, according to Top Drawer Soccer. It was quite a grab for Vidovich, and a crucial one heading into his second year. Edward was one of nine players to commit to the team for the upcoming season, and the class included several other players with a chance to make an impact right away. Among them are three-star forward Andrew Walczyk and Javi Perez — the former captain of Valencia CF, one of the most respected youth teams in La Liga, Spain’s top soccer division. With all the new talent, it’s hard to imagine a coach with the pedigree of Vidovich continuing Pitt’s recent losing history. First of all, he now has the players he wants on his team — or at least some. He knows what their strengths and weaknesses are and can begin to instill his way of play in the program. His track record indicates the scoring will improve. His final five Demon Deacon teams scored an average of 1.65 goals per game, and the success should soon carry over to the Panthers, not only on offense, but on defense as well. In fact, the team’s defense was far and away the better unit this year, often keeping the Panthers in games. They allowed two or fewer goals in all but two of their contests — a 3-0 loss to North Carolina State and 4-0 defeat by No. 7 Syracuse. The defensive unit has a chance to improve this year as well with five players returning. Both goaltenders are coming back, with redshirt sophomore Mikal Outcalt looking to build on his freshman campaign, one of the lone bright spots for the Panthers. Outcalt lead all ACC goaltenders with 88 saves and also put up an impressive save percentage — stopping 81.5 percent of the shots he faced. It was good for third in the conference, behind Wake Forest’s Alec Ferrell and North Carolina’s James Pyle. While Vidovich might not want to see his goalie so busy — the team allowed 14.9 shots per game — at least he has someone in the net he can count on. It should go a long way this year, but there is still a multitude of improvements the Vidovich and the team will look to make. So this year may not be great. More than likely, the team will finish under .500 for the 17th consecutive year. But it should make noticeable strides forward and win at least a couple more games. No matter what, the expectations will be raised and Vidovich will be held to a higher standard in his second year. He should deliver the program a conference win — maybe several — and offer fans a more exciting, offensive-oriented brand of soccer. The struggles in his first year were understandable, and it will take time to create a winning culture within the team. But his coaching history and decisions this offseason suggest he has the knowledge and ability to do it.